The green sea turtle is one of the largest and most widespread of all marine turtles and is found in warm tropical waters from New England to South Africa and in the Pacific from Western Africa to the Americas. Adults measure more than three feet long and weigh 220 lb on average. The green sea turtle gets its name from the green color of its body fat. The carapace is oval-shaped and varies in color from olive to brown, gray and black with swirls and irregular patterns. The undershell (plastron) is pale yellow or orange in color. Males are usually smaller than females. 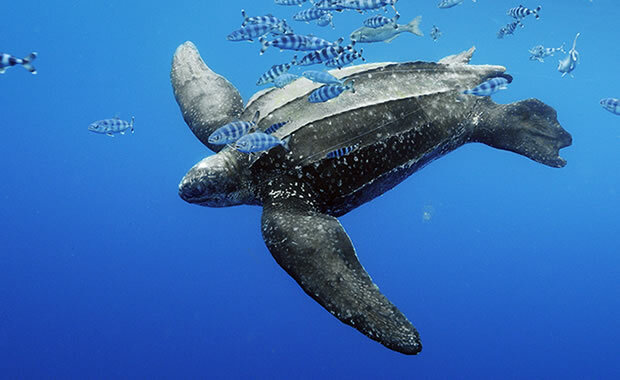 Found only in tropical waters, these turtles rarely leave the water, except for when it is time to nest, or when they wish to bask in the sun to get warm. They are herbivores and feed on seagrasses and algae. When ready to mate, sea turtles migrate hundreds of miles across the ocean to the place where they hatched. The females also use the same beach to bury the eggs in the sand. Incubation lasts between 45 and 70 days. When eggs are ready to hatch, the hatchlings using a special tooth (that eventually falls off) to break the egg open, and then must use their front flippers to dig their way up to the surface. After reaching the surface, they immediately make their way back into the ocean. The young turtles are vulnerable at this time to a variety of predators, such as crabs and gulls on the beach, and to sharks and dolphins in the water. Green sea turtles are mainly threatened by predation by animals and humans. They are overharvested for their meat and eggs in many areas. The meat is highly prized, and the cartilage underneath the plastron is used for making turtle soup. Also, some green sea turtles are accidentally caught by fishermen. This species is legally protected in the United States, and in United Kingdom protected from excess harvesting. Copyright Notice: This article is licensed under the GNU Free Documentation License. It uses material from the Wikipedia article "Green sea turtle". Glenn, C. R. 2006. 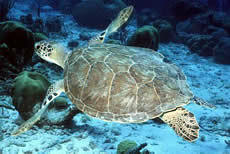 "Earth's Endangered Creatures - Green Sea Turtle Facts" (Online). Accessed 4/18/2019 at http://earthsendangered.com/profile.asp?sp=821&ID=9. Need more Green Sea Turtle facts?